Anti-Hair Loss Shampoo Hair Loss Fighting Formula Natural Treatment Regrow Hair Anti-Dandruff Anti-Breakage Active Ingredients Rosemary Biotin Zinc Evening Primrose For Women and Men - Luxury Beauty Care Products ! This Anti- hair loss shampoo helps to reduce hair shedding and promotes healthy new hair growth. It works to restore hair in the thinning. This hair healthy blend works together to stimulate the hair follicle and grow thick luscious full and healthy hair. This topical hair loss shampoo tackles the hair shedding negative influences ton your scalp. 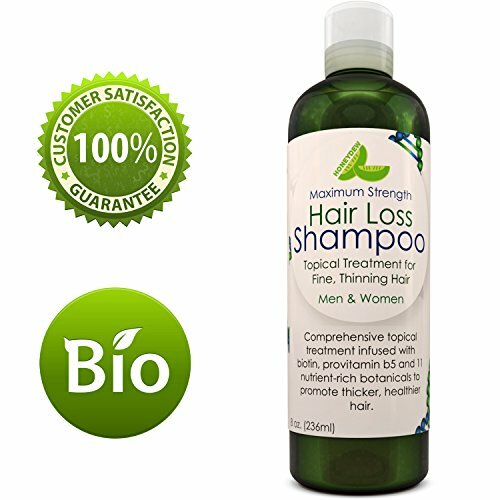 This anti-hair loss shampoo contains hair helping ingredients such as rosemary evening primrose oil argan oil coconut oil mulberry green tea tress and biotin which nourishes the scalp and encourage healthy hair growth.THICKER FULLER LOOKING HAIR - the key to thicker looking hair lies in the scalp. If the scalp is clean and clear and clarified, then the hair will grow in healthier and thicker. This maximum strength shampoo contains rosemary which clarifies the scalp and keeps the scalp healthy and dandruff free thereby creating an ideal environment for healthy hair to grow in. It also contains sesame which is a great source of iron zinc and selenium which all are integral parts of health hair growth. This entry was posted in Hair Care on July 1, 2016 by admin.